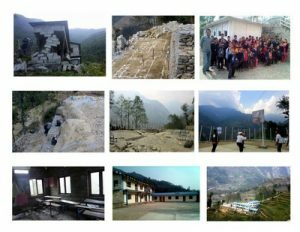 Late last year we signed a Memorandum of Understanding (MOU) with the Nepali government that we would rebuild as necessary 15 of the Helambu schools which Mondo has been supporting that had been completely destroyed or badly damaged as a result of the April 2015 massive earthquake. 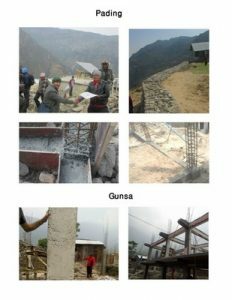 The MOU committed us to rebuild the schools in a two year period and even before it was signed we have been raising funds from our generous donors, planning and agreeing our designs for earthquake resistant structures with both each of the villages and with the government who must approve them. Already we have progressed far enough with two of the schools, Birkharka and Nakote, to enable them to be brought into use and for children to start to enjoy their new solid school environment rather than the Temporary Learning Centres they have had to make do with until now. 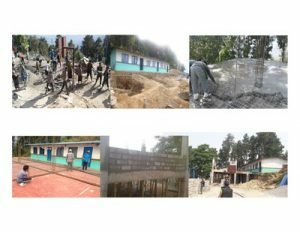 At Birkharka we have completed three classrooms and a new toilet block and are working on completing six more classrooms. At Nakote there has been a major repair job rather than a build from scratch but this has encompassed 14 classrooms, the playground and fencing and the building of a new toilet block. Other building works are making good progress but not without their problems. 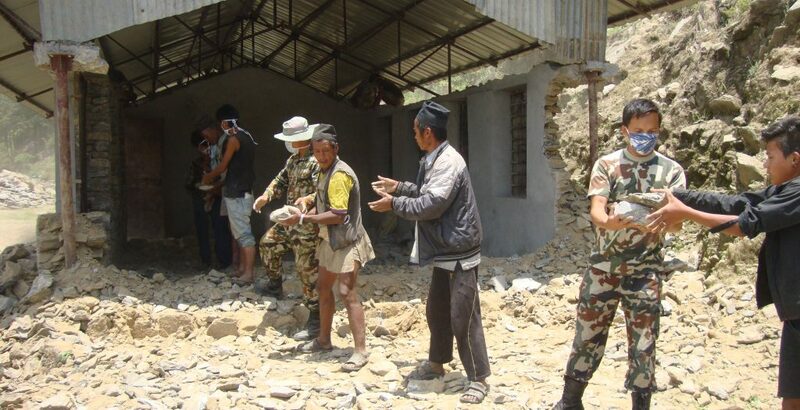 At Tartong the school was completely destroyed and indeed to site no longer usable. A new site was chosen which – no surprise to those who know the terrain – required levelling. We knew this was a significant bulldozer job but not how significant. 267 hours of bulldozer work shifting far more boulders than anyone imagined would be necessary later the job was completed and now the rebuilding work has started. At Pading, another school where the useful remains of the school were few, we have started rebuilding 8 of the needed classrooms. Here also a new toilet block will be needed as well as much other work including fencing and drinking water provision. One of our biggest schools at Gunsa needs 8 new classrooms and major repairs to the 8 that survived. 14 of these have already been started and we hope to finish these and 6 of the 8 Pading classrooms before the monsoon starts and necessarily halts work for a number of months. A different piece of building work is taking place at Norbuling. Here we are building a brand new girls hostel which will be a much needed addition for children from various surrounding villages too far for a daily walk. 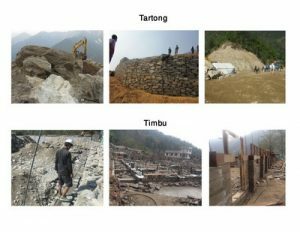 We are also working on a hostel down in the valley at Timbu and, although they will probably not be completed by the monsoon we hope to have done enough to put both hostels into use before rain stops work. Meanwhile planning is at an advanced stage for several more schools and we hope to get at least two more agreed and started before the monsoon and planning underway for others so that work can commence in October. The challenges site by site are many but the determination and resourcefulness of the team is great. The masons we have trained are doing well all under the guidance of our onsite supervisor and with the full involvement and management cooperation of the local School Management Committee. A huge amount still to do but excellent progress to date.